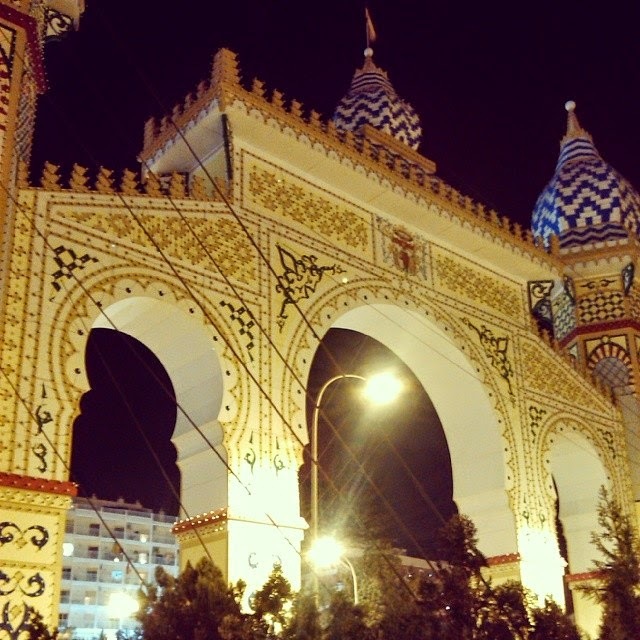 The tents of the Feria are very iconic due to their red/white and green/white stripes. Usually they are very lavishly decorated inside. The sides of the casetas are pulled to the side so take a peek and marvel at the painted chairs, the covered walls or the gorgeous looking ceilings. 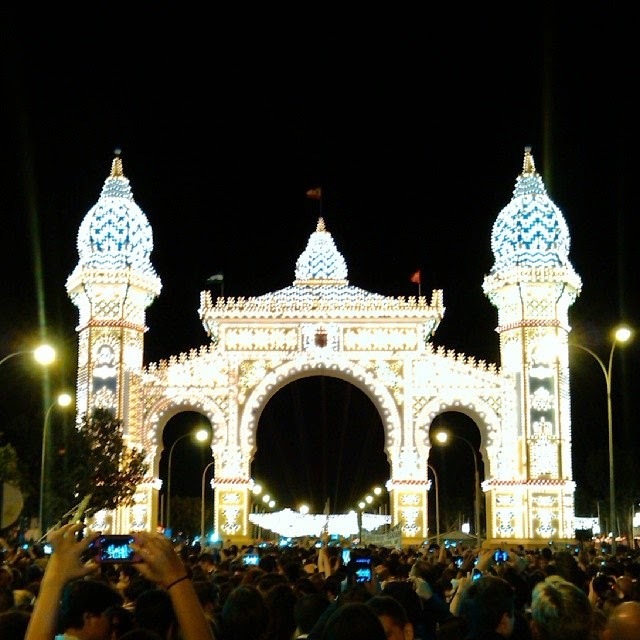 There are more than a thousand casetas so it’s a good idea to look at a Feria plan if you’re looking for a specific one. They are sitting next to each other from wall to wall, some of them bigger, some of them smaller, depending on the community/company who pays for them. Most of these are in private hands meaning you cannot enter without an invitation and a security guard will make sure that it is so. (However our Spanish friends said that if you look a bit smart and ask nicely, for a small fee they will let you in to some of them.) There are public ones as well that belong to charities and political parties however they can get very crowded and later in the evening quite rowdy, too, therefore it’s not advised to stay in them too long. The ‘official’ drink of the Feria is the rebujito which is white wine mixed with 7UP. The wine they use is the strong Manzanilla or fino. Even a few years ago they served these without a mixer but due to obvious reasons it needed to be diluted resulting in this light, refreshing drink. Now the Manzanilla they serve you on the grounds actually contains less alcohol. The food on the Feria is usually very expensive and the quality leaves something to be desired. The most popular dish is pescadito: deep fried fish. On the night of lighting up the La Portada it is a tradition to eat fried fish. For some magical reason there is no siesta time on the Fair meaning that you can buy food all throughout the day. Oh, the gorgeous flamenco dress, the traje de flamenca! It is a loud, spectacular (and VERY expensive) piece of material that the female half of the city adores with a passion. Every year in January there’s a designer show in the city where the new trend is decided and as you can imagine, there’s a slight change to it in each year. It means that if you want to be trendy, you have to reach deep into your wallet. You also have to spend on shoes and other accessories, too. Read more details about it here. Here´s Penélope showing off her gorgeous dress. 6. What about the guys? They just simply wear jeans and T-shirt. Seriously. If they want to dress up a bit they put on a shirt. Without a tie. It has to be said though that in many casetas a suit is a requirement. 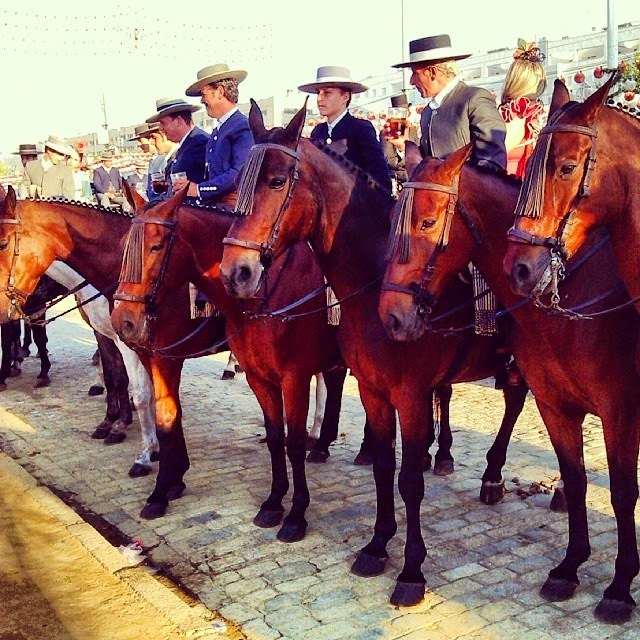 There is a traditional wear for men as well called traje corto which you can see on the horsemen. It consists of tight trousers, a short jacket and comes with a flat hat. There are many of these. 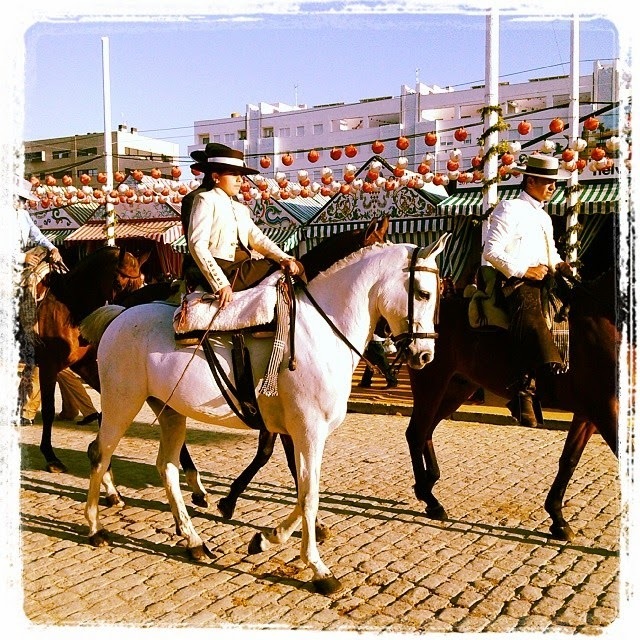 Everybody who has a horse seem to dress up and ride to the Feria and just walk around. This is the same for the carriages, too. It gives a chance for the wealthy to flaunt their wealth and be seen by the public. They are also great subjects for photography. There is a special sand like powder on the ground that is usually used in bullrings. 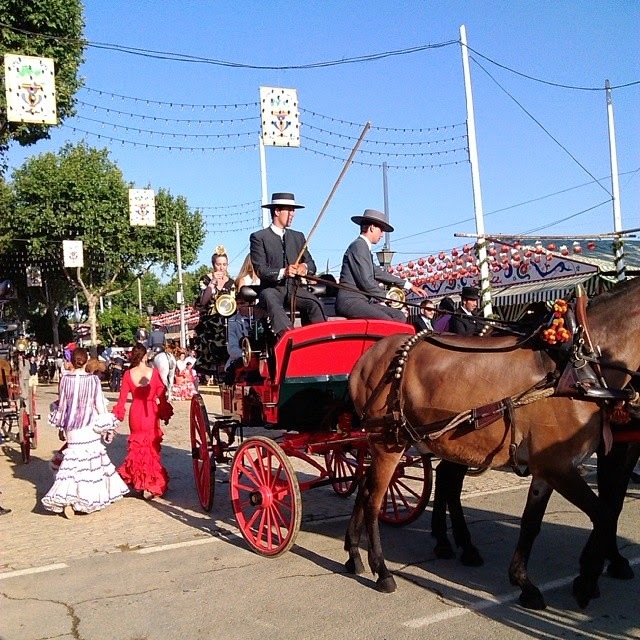 It is transported over from another village outside Seville. It will cover your footwear so make sure that you don´t wear your most expensive high heels. There are many ways to get there. It is possible on foot, depending on where you live, of course. You can use the metro as well but it will be crowded and it might ruin your mood. There are special shuttle buses that leave from Prado. You can also use the Seville bikes, the Sevicis, but check the bike docking stations on your free app as they will probably be full. 10. What’s the point of it all? Well, we’ve been wondering about the same thing. 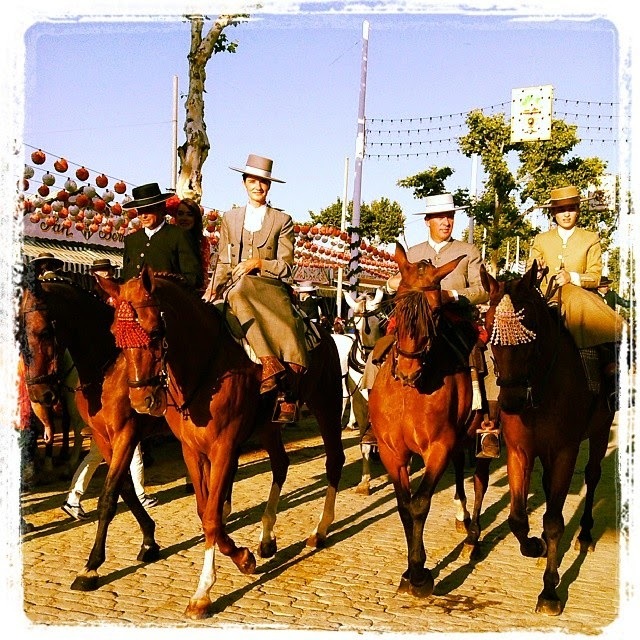 Originally it started as a three-day livestock market in the middle of the 19th century and very soon it was turned into a fiesta. Now there is no animal selling/buying at all and it lasts for six days but there are many events before the starting date, too. As far as we can see it’s a week-long eating-drinking-dancing party which is attended by the whole city.